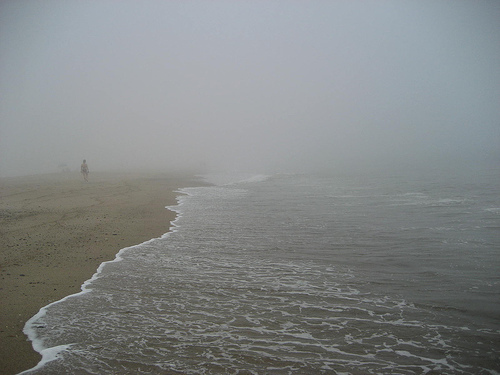 Would your character walk alone on a beach on a foggy day? I had a strange and vivid dream the other night. I had been placed in an elaborate setting and filled with all sorts of intricate details. The dream repeated throughout the night--I remember three distinct times the actors (for lack of a better term) appeared and reappeared. Alongside a cast of various colleagues, a deceased superstar also made his appearance. To say the least, it was very strange and I relayed the dream to a friend who knows the players, minus the superstar. Finally, I can explain why I feel this dream felt so important to my writing. Just as with writing, you want to bring depth to your characters. But you also want to signal to your reader--often through small actions, personality traits that have an impact on the other actors. Craig, Sue, and Trudy provided that. It is those actions (or something similar) I may use for one of my characters. The specific actions or certain behaviors of these real folks had crystallized in my dream. The dream, even as extravagant as it was, seeped realism to me because these simple actions or reactions. I couldn't see all their movements or hear what they were saying, but they communicated a lot of their personality through these small, repeated actions. And this dream will probably inform my future writing. What about your dreams? When you are writing your story, what small action details do you add and subtly repeat to communicate a larger picture to your reader? And, out of curiosity, have you ever had a celebrity appear in your dreams? If so, who? Elizabeth King Humphrey writes and edits, when she is not having strange dreams. She lives in coastal North Carolina. This is something I need to work harder at adding to my stories. So far, whenever my MC is upset she fiddles with the bracelet she always wears. It has meaning I just haven't had the opportunity to add it in yet. Something I have been working on is how characters act differently around certain people. One in particular practically seems to have multiple personalities, because he acts so differently around friends vs. family. It's important to give each character a recognizable trait - a habit, action, etc. - so readers are clued in. When I read, I wonder why a certain character has a specific trait and usually, the author brings out that meaning through the storyline. And yes, I have a recurring dream that includes Matt Damon as Jason Bourne. It's crazy, but also a lot of fun to "see" myself in those action scenes. HA!